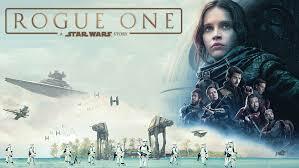 Star Wars "Rogue One" was an intriguing movie providing the background to Star Wars: A New Hope. The plot is about how the Rebel Alliance acquired the plans to the Death Star. I wouldn’t recommend watching it, because the way that Star Wars Rogue One was put together is much worse than that of the other seven Star Wars movies. This movie ruins the mystique of Darth Vader, because the helmet prop used in this movie is tinted red, especially the eye pieces which are now fully dark red instead of deep black. The Death Star animation effects are one of the few things in this movie that has improved since the last star wars movies.... there is much more detail when a planet is destroyed. Some characters who make a return in this movie are Princess Leia, Darth Vader, Grand Moff Tarkin and Emperor Palpatine(AKA Darth Sidious). Princess Leia appears briefly at the end of the movie. Darth Vader appears several times throughout the movie. Lord Sidious appears only once.